On Tuesday morning, CNBC’s Rick Santelli raged against the American media in light of a New York Post report alleging that Census bureau employees have been caught “fabricating” some data that went into unemployment reports over the last several years, including possibly the controversial report revealed one month before the 2012 election. The September 2012 jobs report showed a dip in unemployment from 8.1 to 7.8 percent, raising eyebrows among many business-oriented personalities, including former GE CEO Jack Welch and Santelli himself. While these so-called “jobs truthers” alleged “ideological” motivation behind such data manipulations, the Post report indicates that if there was any widespread manipulation, it was due to Labor Department demands being so high that Census employees simply made up information to fulfill a quota. 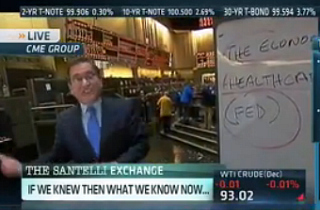 Nevertheless, on Tuesday morning, Santelli felt vindicated by such reports indicating any level of manipulated data. During his “Santelli Exchange” monologue, the veteran Chicago-based reporter railed against his media colleagues for dismissing his suggestion that the pre-election numbers could have been incorrect. Santelli seemingly suggested that if we had known back in September 2012 that the president’s “grandfather clause” on the Affordable Care Act would turn out to be a “lie,” the way the media treated that pre-election jobs report might have been different. The CNBC reporter moved into a shout as he railed against how that potentially “fake” jobs report resulted in Federal Reserve undertaking monetary policies that drastically shifted the economy.